Barbecue sauce in a small container. You will need your bento box (best with 2 separate boxes, but one with separate compartments is just as good) to store your food. Also, a small pot to cook sausages, and knife. You may use small sieve to dry the vegetables. Cut sausages into 3 pieces (6 pieces total) and make cross incisions on each side of the sausage bit. Toss them into a pot of boiling water and turn off the heat. Let the sausages sit in the hot water until you are done with other things. You can also take sausages out to let them cool a bit before you assemble the top box! 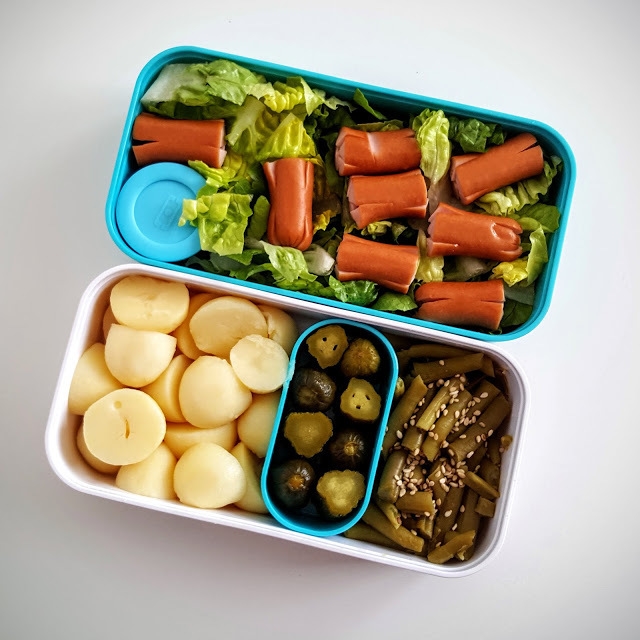 Slice potatoes and cornichons into smaller pieces to use most of the bento space. You can dry them in a sieve. Dry green beans and sprinkle with sesame seeds. Wash, dry and slice your lettuce into medium-sized chunks. In the bottom box (the rice box) put potatoes, cornichons and green beans into 3 large groups. Use separators or smaller containers to keep them from mixing. Fill the top box with sliced lettuce, barbecue sauce container and put sausages on top. All done!